One of the recurring searches that leads to our site is some variation of “Is Embroylisse a dupe for Charlotte’s Magic Cream.” Wanting a dupe for Charlotte Tilbury’s Magic Cream is understandable: it’s now an eye-popping $100 for 1.7 oz. ($58.82/oz.). Embryolisse Lait-Creme Concentre is a bargain at $16 for 1.0 oz. or $28 for 2.6 oz. ($10.77/oz.). 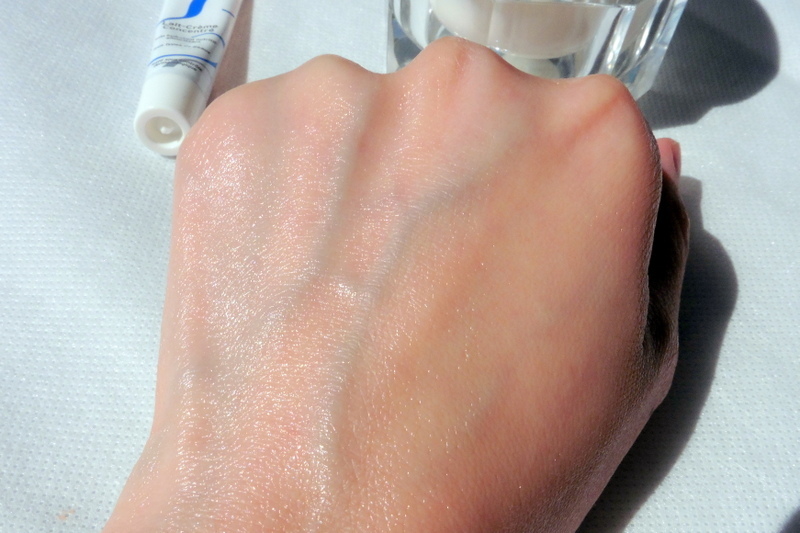 In my review of Magic Cream, I stated that they weren’t dupes based on trying Embryolisse on the back of my hand. 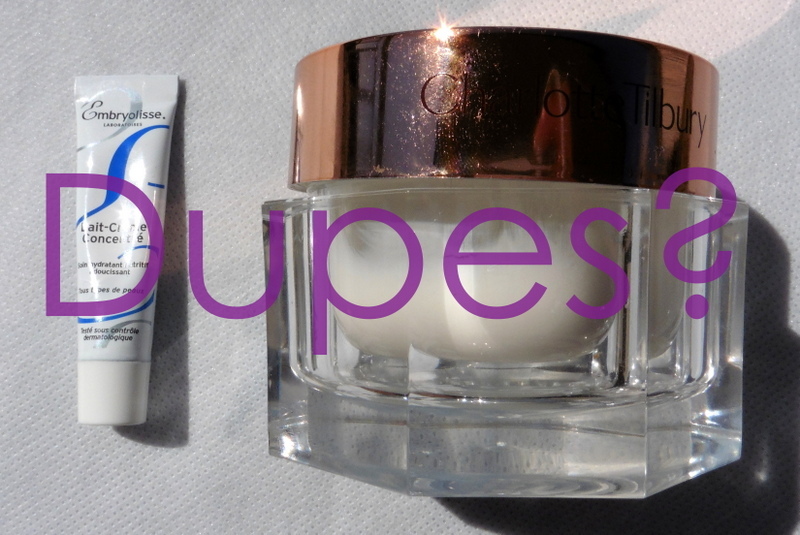 Since then, I’ve tried a sample of Embryolisse and can do a more detailed comparison of the two. Is Embryolisse a Dupe of Charlotte’s Magic Cream? As an initial matter, I have to say that I bristle at the use of “dupe” because it’s become so overused. A dupe really would have to be so similar as to be nearly or actually indistinguishable from the dupee (not a word, I know). For skincare, merely sharing the same ingredients doesn’t suffice to qualify as a dupe if aspects such as texture and effectiveness are not replicated. For example, the combo of fruit, sugar, and water can result in sorbet, popsicles, juice, or something entirely inedible. The Beauty Brains explained this well here (the article basically says it all, but if you want to listen to the podcast, the discussion starts at 7:45). In short, ingredients are only part of what makes a product. Now I’ll sound snobby, but I’ve noticed some silky and refined textures in high-end skincare that I have yet to find in cheaper products. What comes to mind: La Mer The Treatment Lotion, Tatcha Ageless Enriching Renewal Cream, and yes, Charlotte’s Magic Cream. To be sure, there are also lots of overpriced, ordinary products, and the end results can usually be replicated with cheaper products. But occasionally, a high-end product has a tangible quality not apparent from the ingredients and that isn’t replicated by so-called dupes. 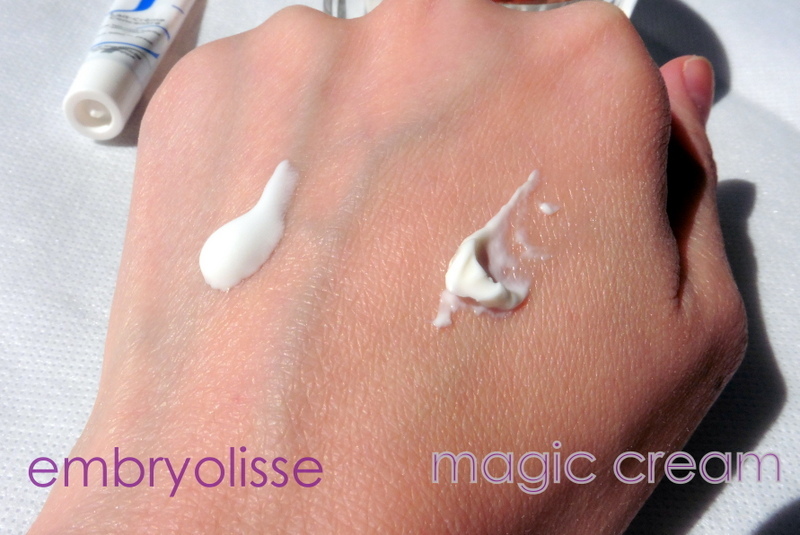 If you’re just wondering whether Embryolisse is a functional dupe for Magic Cream, the answer is YES in that both moisturize the skin well (I have normal to dry skin) while creating a smooth, slippery canvas for makeup application. But if function were the measure, then most anyone’s favorite moisturizer would probably qualify as a “dupe” for Magic Cream. Ingredients: Both have moisturizing ingredients, but Magic Cream also has some “actively” anti-aging ingredients such as peptides and antioxidants. (Full ingredient lists are pasted at the bottom.) I haven’t used either product consistently enough to know whether the anti-aging ingredients make a difference. Texture & Appearance: Embryolisse is more liquidy (like a lotion) and looks opaque, while Magic Cream is firmer and denser (almost like a light balm). In fact, I had to dig and scoop out that bit of Magic Cream shown above because it’s so dense. 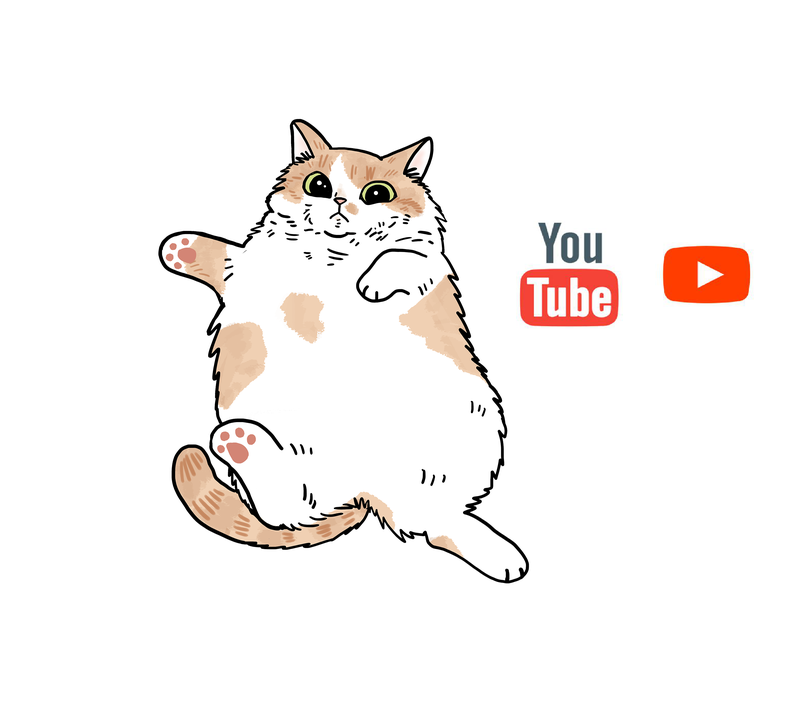 I usually firmly swipe my fingertips along the surface to pick up the product. Tactile experience: Embryolisse has slightly less slip/more resistance than Magic Cream during and after application (is it the beeswax?). Magic Cream feels thinner, has an oilier slip, and begins to sink in sooner. I would never have noticed this difference if I hadn’t tried them side by side. Certainly, both apply very smoothly and create a smooth base on the skin. Since Magic Cream stays sort of oily/slippery, it is better for facial massage. Finish: Magic Cream leaves a glossy, moisturized shine whereas Embryolisse dries down to more of a soft satin finish (shinier if more is used). Due to Embryolisse’s lower sheen level, it visually blurs the appearance of pores slightly. But as you can see below, both just leave the look of moisturized skin. 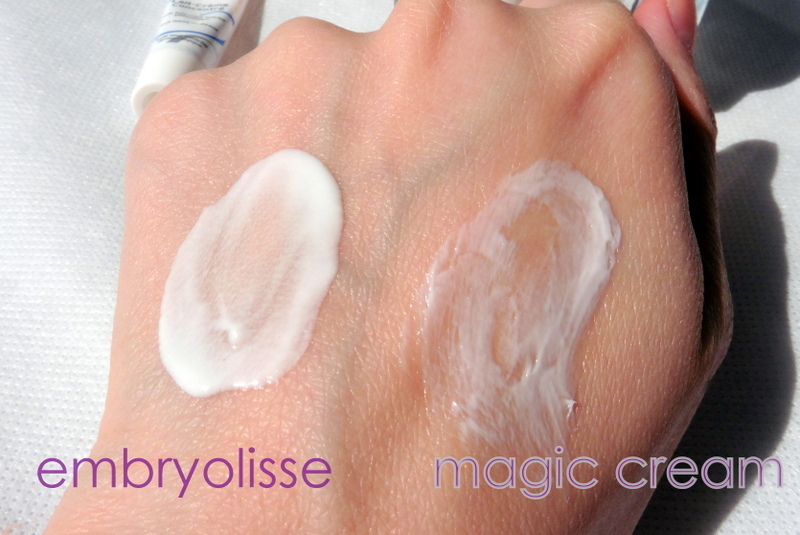 Bottom line: Embryolisse is not a dupe for Charlotte’s Magic Cream. Nonetheless, it’s a solid choice for a moisturizer and a makeup base and probably suits more skintypes and more people’s preferences than Magic Cream does; Magic Cream’s finish looks heavier (even though it doesn’t feel heavy) in a way that isn’t usually sought out by anyone but the driest skins. There are many moisturizers (not just Embryolisse) that serve the same function. However, Magic Cream remains a high-quality moisturizer for dry skin if you can tolerate the markup for the branding/packaging/legend. Personally, I would repurchase Magic Cream but not Embryolisse. I’m just meh about Embryolisse and prefer the oily slip of Magic Cream. Realistically though, I won’t actually shell out the money for Magic Cream again. I already alternate Magic Cream with cheaper moisturizers and I don’t notice enough of a difference in my skin or makeup application to justify rebuying. Water (Aqua), Paraffinum Liquidum (Mineral Oil), Stearic Acid, Glyceryl Stearate, Triethanolamine, Cera Alba, Cetyl Palmitate, Butyrospermum Parkii (Shea Butter), Steareth-10, Polyacrylamide C13-14 Isoparaffin, Laureth-7, Propylene Glycol, Hydrolyzed Soy Protein, Aloe Barbadensis, 1,2-Hexanediol, Caprylyl Glycol, Tropolone, Parfum. 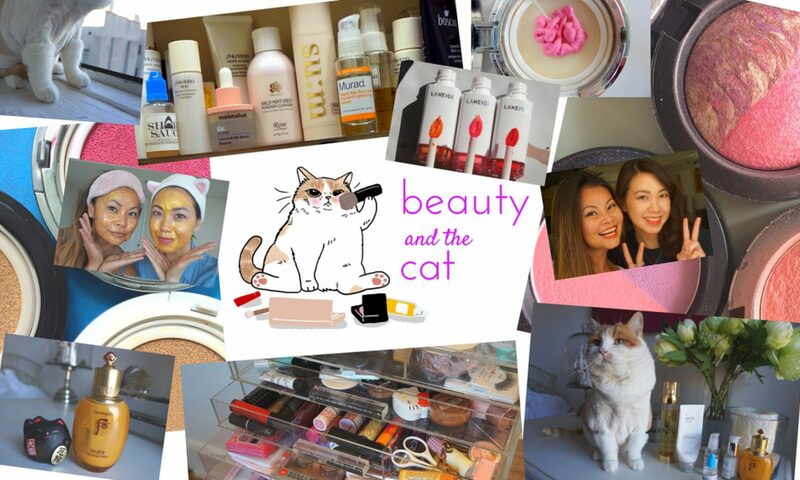 CategoriesAngela, Skincare TagsCharlotte Tilbury, Embryolisse, Worth It? Note that many antioxidants are vulnerable to light and air. 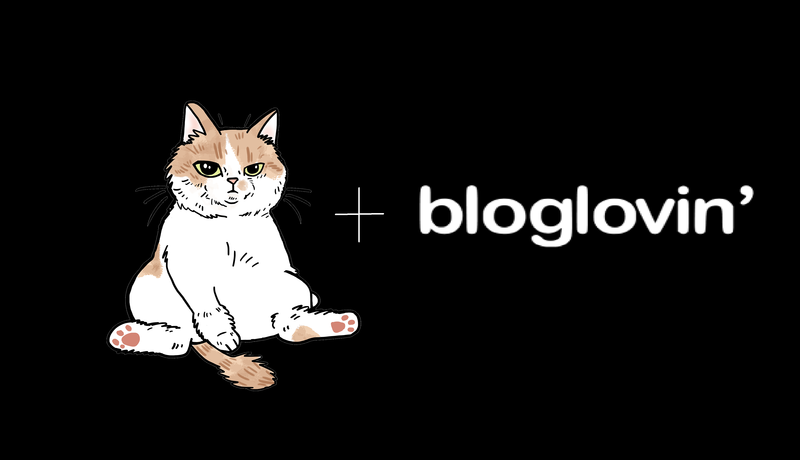 The clear jar will allow more than enough light and air to destroy most of the anti-aging ingredients. You’re probably better off with fewer ingredients in an opaque tube. Also, dipping your finger isn’t as sanitary as a pump or tube. Use a clean plastic paddle, if you’re going to be dipping into a jar.